When E.J. Henderson’s(notes) left femur essentially snapped in half in a game against Arizona in December, the gruesome nature of the injury shook the Minnesota Vikings and reduced some of the toughest guys around to tears after the game. The vision of their defensive captain’s leg flopping grotesquely to the turf was devastating, and some wondered if he ever would play again. Less than eight months later, Henderson is back on the field and his stunning recovery is having an equally strong effect on the team in the first few days of training camp. The quiet Henderson is not a Ray Lewis(notes), fire-and-brimstone type of leader. He smolders in the huddle, quietly and calmly making the calls with a style that is perfect for this veteran unit. There is no more respected player in the locker room than the middle linebacker, who is battling back from his second serious injury in the past two years. Henderson missed the last 12 games of 2008 after a freak foot injury and was finally appearing to return to his dominant form in 2009 right around the time he collided with safety Jamarca Sanford(notes) while running down Cardinals running back Tim Hightower(notes). He was in incredible pain on the field and was carted off while younger brother and teammate Erin held his hands. So how did he do it? How did Henderson go from his career being in jeopardy to expecting to be in the starting lineup on Sept. 9 against the New Orleans Saints in such a short period of time? Doctors placed a titanium rod in Henderson’s leg during the surgery, and now Henderson said he does not feel any pain while running or cutting. If Brett Favre(notes) is the Vikings’ Iron Man, let’s call Henderson their Titanium Man. Henderson has been on the field with the first team for significant stretches over the first two days of camp. But he is not yet participating in some of the heavier contact drills as the Vikings ease him back into the fold. In many ways, Henderson said this process was easier than returning from a back injury he suffered in college at Maryland. Rookie Jasper Brinkley(notes) filled in admirably in Henderson’s absence last season, with veterans Ben Leber(notes) and Chad Greenway(notes) taking on more of the heavy lifting to help the Vikings reach the NFC title game. Henderson, of course, watched that gut-wrenching loss at New Orleans from the sideline, feeling helpless as Drew Brees(notes) drove the Saints into position for the winning field goal in overtime. 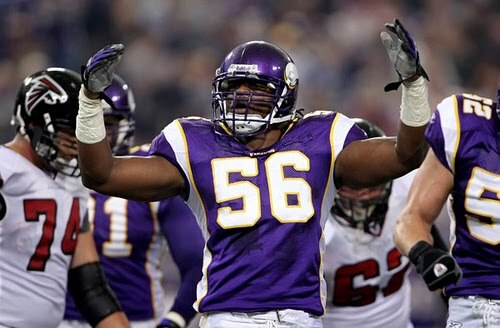 The Vikings begin the 2010 season right where the 2009 season ended, and Henderson is determined to be on the field this time. Baltimore Ravens offensive tackle Jared Gaither(notes) experienced a scare during the afternoon practice Thursday when he was carted off the field with lower back pain with trainers applying ice. Safety Tom Zbikowski(notes) had cramps, too. In a surprising development along the Ravens’ offensive line, Gaither and Michael Oher(notes) both took turns at the pivotal left tackle position at the launch of training camp. The Ravens had moved Gaither to the right side during minicamps after he skipped the majority of the offseason conditioning program. He was sidelined for all but a tiny portion of the spring practices with a bruised foot, and he was the subject of rampant trade rumors. Now, he’s suddenly a prime contender to retain his old position. “I have no expectations,” Gaither said. “Really when I was coming into camp, I just planned to keep my head down and work. That’s what I’m doing. That’s my approach every year. No matter what happens, work. Who will protect the blind side of franchise quarterback Joe Flacco(notes)? Will it be Gaither, a 6-foot-9, 315-pound former University of Maryland blocker? Or will Oher, an all-rookie selection last year who started in Gaither’s place several times last season due to injuries, assume the role? “We’re going to play the best guys in the best position,” Ravens coach John Harbaugh said. “For our offensive line, I think that has yet to be determined. So, Jared will get shots at the left and the right side, Michael will get shots at the left and the right side. The multi-tasking aspects of learning both spots with vastly different footwork and types of defensive lineman to block presents a major challenge. He has lost a lot of weight, about 25 pounds. That should alleviate the additional pounding on his foot and toe, which have hampered him in the past. He resembles his old Eleanor Roosevelt days when he was a good enough basketball prospect that the University of South Carolina offered him a scholarship. Gaither said he didn’t let the trade rumors frustrate him. Gaither was linked most often to the Buffalo Bills, but nothing concrete emerged as general manager Ozzie Newsome said that the Ravens didn’t receive any offers that interested them enough to go forward with trade discussions. “I’m not a disgruntled person,” Gaither said. “I’m happy and cheerful and smiling all the time. Disgruntled, no. I would never do that to the organization, and I wouldn’t do that to my teammates to cause a distraction or anything. Over the years, the NFL has seen quarterbacks with tremendous hype that could succeed from day one as a starter. The NFL has also seen quarterbacks with tremendous hype that flopped immediately and can lead a cattle drive better than a touchdown drive. The NFL, however, has never seen Tim Tebow. 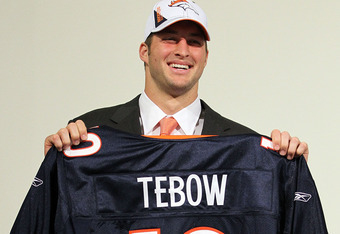 Coming into the NFL Draft, the media had never been as polarized on a player’s prospects as they were with Tebow. Some said he has no chance of ever starting in the NFL, while some think he could be the next John Elway. And when Broncos’ coach Josh McDaniels drafted him 25th, everyone started going insane. On Thursday, Tebow officially became a member of the orange and blue, signing a five-year contract worth up to $33 million, with $8.7 million guaranteed. Sounds like a sizable investment for what appears to be the gamble of the decade. So what’s the best way to protect a gamble? Make sure it’s a safe bet. Let’s face it; Denver’s quarterback situation is as stable as Chernobyl. Current starter Kyle Orton had his best year in the NFL last season, but it’s almost a lock that no one in the Mile High City wants him to lead the Broncos for the next five years. Brady Quinn isn’t exactly the future either. His years with the Cleveland Browns have made the Dawg Pound wish Michael Vick came around more. If Orton reverts back to his earlier days and starts the season with a handful of losses, which is definitely possible with four of the Broncos’ first six games against teams .500 or better last year, the chants for Tebow will start quickly. Jesus never got this many shout-outs at a football game before. But McDaniels cannot give in to the fans heckling at any point in 2010. If Tim Tebow starts in any meaningful situation during his rookie season, the ex-Florida Gator hype machine could crash immediately. Sure, there have been rookie quarterbacks who took to the position immediately. The Falcons Matt Ryan and Steelers Ben Roethlisberger were outstanding in their inaugural seasons under center, with only a few growing pains. Tebow, however, couldn’t be less like those to guys. First off, Tebow is clearly a project, no matter if you think he’s will meet the hype or not. A new throwing motion may look good in workouts, but until he gets some full speed preseason attempts, there’s no way to know his confidence in it. He’s also playing in a much different offense in Denver than he did in Florida. Even when he gets on the field, he won’t be jumping in mid-air and tossing to a tight end like he did under Urban Meyer. Give him time to learn the system, and he’ll be ready. Second, Broncos’ fans are insane. Say what you will about the Rockies and Nuggets success lately, but the Broncos could be 1-15 and the team would still be Mile High’s favorite son. Tebow knows about die hard fans, but the NFL is brutal. If he replaces Orton and has a couple stinkers, there will be effigies and riots that could shake even the hardest of men. But not Chuck Norris. He can riot by himself against the city. Third, and most importantly, if Tebow starts this year, the cat’s out of the bag. People will see him for exactly what he is, and the speculation will go away. Obviously, he could be a fantastic quarterback, and he’d be just as popular as ever. But the interesting part is if he’s awful. He loses a lot of admiration from the city and can be seen as a waste of pick for a team that needs to go back to the playoffs. Without even setting foot in an NFL game, look how much he’s already done based on hype. His Denver jersey is one of the highest sellers in the entire league, and he’s already got deal with companies like Jockey to be a spokesperson. That all goes away if people find out he stinks. Sure, there will be people who reminisce over his Gator days, but few people remember Leaf for his Washington State days. McDaniels is doing the city and the team a big favor by not playing him. Everyone can still speculate over how good he is, and McDaniels buys himself another year on the job for not looking like a fool in the draft. Although, after getting rid of Jay Cutler and Brandon Marshall, his Fool Meter is near full. So while it might seem like the Broncos need a change to avoid missing the playoffs for five straight seasons, the change shouldn’t involve Tebow. The Broncos need to pull a Jon Kitna-Carson Palmer deal and sit Tebow until his sophomore campaign. Or they can pray he’s the second coming. It’s their choice. Five-time Pro Bowler Flozell Adams got national media attention last season for two things, at times not being able to protect Tony Romo's backside and secondly, tripping Giants defensive end Justin Tuck when he got beat. 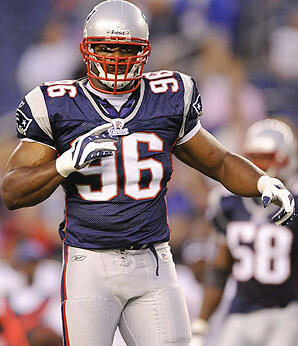 Thursday the Pittsburgh Steelers signed the 35-year old tackle to a two-year contract. To Adams credit, his departure from Dallas was less about his ability and more about his $6.5 million salary. Adams will replace right tackle Willie Colon who will miss the season with a torn Achilles tendon. It has not been determined if Adams will play right tackle for the Steelers, or if current starting left tackle Max Starks will play right tackle and Adams staying with the position he has played his entire career at. If Albert Haynesworth(notes) believed he could spend seven months challenging the icy will of Redskins coach Mike Shanahan then expect to be forgiven, he learned the futility of that hope halfway through a fitness test he would not pass on Thursday afternoon. 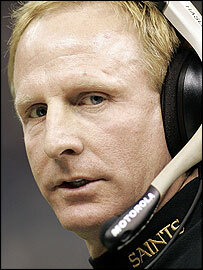 Few men in the NFL can carry a grudge like Shanahan, who harbors resentment behind a forced smile. Valued assistants and longtime colleagues tell of their relationships with the coach in hushed whispers. Some have begged not to be interviewed. They value the coach’s knowledge, admire his obsession for detail. But they also fear him. Even long after they have stopped working with him their words quiver when his name is raised. Some say they fear they might say the wrong thing. They don’t want to cross him. He is a man who does not forget. And after Haynesworth used the winter, spring and half the summer to defy Shanahan, refusing to attend his minicamps and OTAs and conditioning sessions because he didn’t want to be a part of Shanahan’s new 3-4 defense, he finally came back to the Redskins this week. Whatever leverage he had was exhausted, his attempts to embarrass his new coach into dealing him had failed. He had no choice but to return to practice. “There’s a conditioning test he’ll go through,” Shanahan said on Wednesday, the day before camp started. This was a Shanahan invention, officially administered to Haynesworth because he missed a percentage of the offseason workouts, unofficially because he tried to embarrass Shanahan. 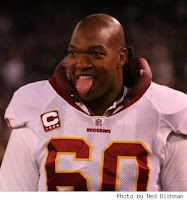 Haynesworth should have understood right then he would not pass the test. Despite Shanahan’s insistence it was a “basic” fitness exam, the test was made to fail. Shanahan refused to reveal the details of the test but it involved lots and lots of running in temperatures that pushed through the 90s in a sticky, swampy muck. Haynesworth, who supposedly shed 40 pounds in the offseason working out with a personal trainer, had no chance. Predictably, he did not speak to anyone during his walk of shame. There is a long list of former players and bosses who have endured Shanahan’s wrath, including Raiders owner Al Davis, who fired him, and once-acclaimed receiver Ashley Lelie(notes), who never played well for him in Denver. Then there was one-time Broncos guard Montrae Holland(notes), who rewarded Shanahan for a contract extension by showing up 20 pounds overweight at the start of training camp in 2008. Like Haynesworth, he was quickly banished from practice, forced through a cocktail of punishments including the treadmill, elliptical machine and stairmaster. 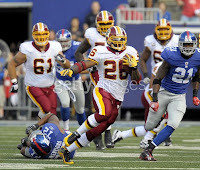 When he was done, he had to run outside just like Haynesworth. After a few days he was allowed to return to only one of the team’s two daily practices. A starter the previous season, Holland could only play for the scout team during that workout. Later in the day, he was forced to run alone on an empty field. His exile lasted two weeks. He lost his job and not long after he was traded to the Cowboys. 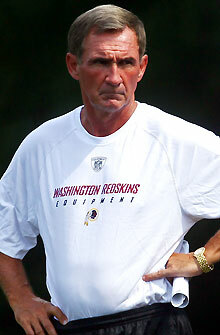 Late Thursday afternoon, Shanahan seemed to revel in his revenge over Haynesworth. He smiled as he stepped onto an interview stage. “I bet I can anticipate the first question,” he said. When that first question was, of course, about Haynesworth, he laughed. Haynesworth will have to take the test again on Friday, he said. And if he doesn’t pass it – a likely possibility given Thursday’s result – he’ll be shipped off to the treadmill once more. “It may take two or three days or it might take a week,” Shanahan said. 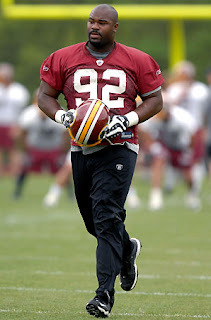 In the days before he returned to the Redskins, Haynesworth had softened his stance against the team, texting with some of the coaches, trying to catch up on the nuances of a new defense installed in the spring. He expressed a willingness to work and the sense among the assistant coaches was one of optimism. Jim Haslett, the defensive coordinator, smiled this week as he described a defense designed to take advantage of Haynesworth’s pass-rushing skills, even though his basic position – nose tackle – is one that doesn’t yield the big sack numbers Haynesworth craved. The plan, Haslett said, was to move Haynesworth between nose tackle and defensive end – sometimes even outside linebacker – frequently during games. Only for seven months Haynesworth wouldn’t listen. As a defensive tackle in a 4-3 scheme he didn’t want to give up the dominance he once enjoyed at the position while with the Tennessee Titans to play a scheme that didn’t seem built for him. 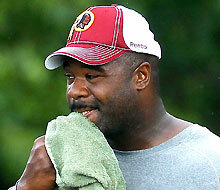 When Shanahan arrived, insisting on playing the 3-4, Haynesworth tuned out. On Thursday he paid the price for his petulance. The coaches say they are excited about nose tackle Maake Kemoeatu(notes), signed in the offseason after missing last year with a heel injury. If healthy he can fill the middle. The idea was Haynesworth could play outside. After receiving $32 million of the $100 million contract he signed before last season, he infuriated most of Washington by appearing out of shape. Shanahan could have provided him a new start. 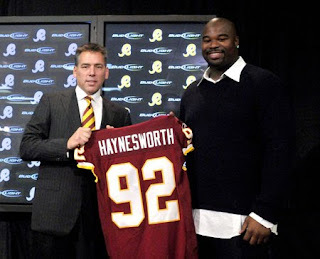 Yet when asked to adhere to his new coach’s plan for him, Haynesworth refused, choosing to scorch the earth. And so on Thursday he ran. Pro Bowl tight end Antonio Gates has agreed to a $36.175 million, five-year contract extension with the San Diego Chargers, making him the NFL's highest-paid tight end. The deal, which runs through the 2015 season, is worth $7.235 million per season, with $20.4 million in guarantees, a source told ESPN senior NFL analyst Chris Mortensen. "Antonio is a special player and person. He is everything we are looking for in a Chargers player," general Manager A.J. Smith said in a statement released by the team. "His talent and contributions to our team speak for themselves. His work ethic and desire to be the best are unmatched. He has been a major part of the success we have had over the past several years, and we are thrilled he will continue to be with us for years to come." With three other star players unhappy about their contracts, talks with Gates apparently intensified this week. Gates and other veterans are due to report to training camp on Thursday, with the first full-squad practice on Friday. I've been blessed my whole career to be with one team." Gates said in a statement released by the team. "It's always good to get [the contract] out of the way. The goal is to win a championship. We all are human and it becomes a distraction even though you might not want it to be. It's always great to be able to go ahead and do what you need to do and get it out of the way." It wasn't clear if getting Gates' deal done would lead to new deals for restricted free agents Marcus McNeill, Vincent Jackson and Shawne Merriman. McNeill, the left tackle who protects quarterback Philip Rivers' blind side, and Jackson, a Pro Bowl wide receiver with two straight 1,000-yard seasons, are unhappy that they haven't been given long-term deals and are expected to hold out through training camp and the season's first 10 games. They are expected to return for the final six games to accrue another season toward unrestricted free agency. Jackson and McNeill were tendered one-year deals at just more than $3 million each. When they didn't sign the offers by June 15, the Chargers were entitled to offer them their same salaries as 2009, resulting in a loss of about $2.5 million each. Merriman hasn't signed his tender for $3.269 million, but the outside linebacker was due a 10 percent raise anyway, which would put his 2010 pay at approximately the tender amount. Still, he hasn't said when he'll report. These negotiations between Gates and the Chargers went much more smoothly than in 2005. Gates held out during training camp that year, leading general manager A.J. Smith to take the extreme measure of placing him on the roster exempt list in an attempt to break the impasse, automatically triggering a three-game suspension. Gates missed the final two exhibition games and the season opener, which the Chargers lost. Gates dumped the agent who represented him then and hired Tom Condon. 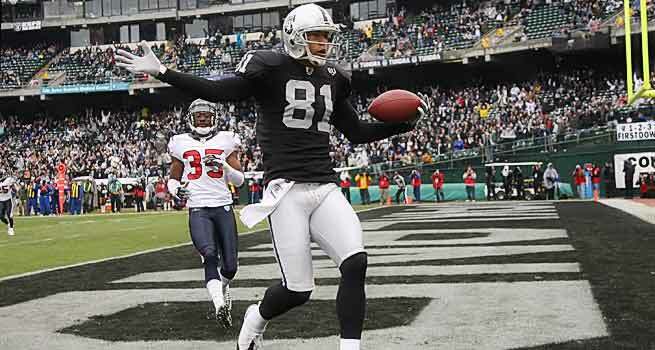 Since his rookie season, Gates leads tight ends in touchdown catches with 59. He ranks second in yards, 6,223, and third in catches, 479. Gates has led the Chargers in catches each of the last six seasons. 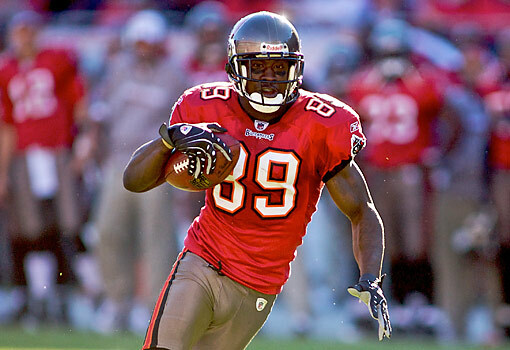 In 2009, he topped the Bolts with 79 catches and a career-best 1,157 yards, with eight touchdowns. 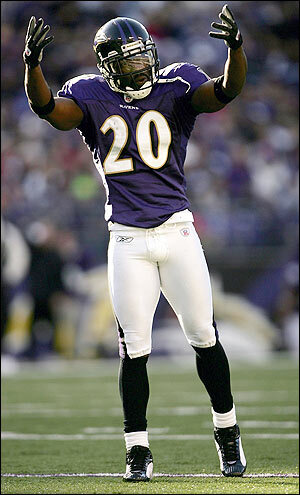 The six-time Pro Bowler and a three-time All-Pro was named to the NFL's All-Decade Team (2000-09). This is the second big contract for a Chargers player in less than a year. Rivers was given a contract extension worth nearly $93 million toward the end of last year's training camp. The Chargers don't appear close to signing RB Ryan Mathews, the No. 12 overall draft pick and the heir apparent to LaDainian Tomlinson. Mathews missed three practices for rookies and select veterans. 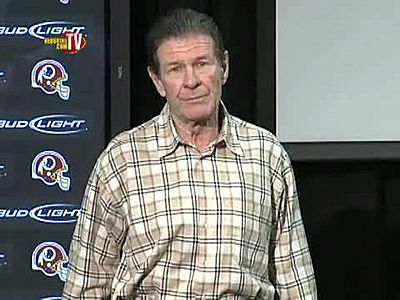 ... San Diego coach Norv Turner canceled Thursday's practice. ... Turner said third-year pro Brandyn Dombrowski sits atop the depth chart at left tackle and will get first crack at starting in McNeill's place, with Tra Thomas, 35, providing depth. "That's great news, but it's the beginning of training camp and I'm not taking anything for granted," Dombrowski said Wednesday. "I'm going to take advantage of the reps I get with the first team and try to make the most of this opportunity." Dombrowski was a super-sub last season, making two starts at right guard and seven starts at right tackle in place of injured teammates. While he hasn't played left tackle at any level, Dombrowski said he's more comfortable playing on the left side. 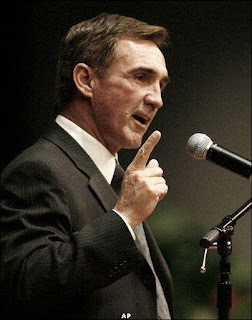 What a coach like Mike Shanahan can do in a short period of time has been documented in previous articles published on The Football ERA. Under his direction, the Denver Broncos rebuilt their lines more rapidly than most franchises usually are able to accomplish. Shanahan is probably the man for the job of shoring up an offensive line that was left in ruins after a season-long series of catastrophic losses last year. The Chris Samuels era at left tackle in Washington is now officially over, and the ‘blindside’ protection hopes of the ‘Skins premier free agent acquisition—QB Donovan McNabb—rests in the development of the 1st Round-4th overall selection—OL Trent Williams. Also gone is their longstanding Guard—Randy Thomas who suffered a severe triceps injury in week 2 against the Rams. He was cut on March 4th. If anyone can rebuild an offensive line—and do it quickly—its Mike Shanahan. He will be assisted by offensive line coach—Chris Foerster because, yes—Joe Bugel has, indeed, ‘left the building’—now retired happily in Arizona. In all fairness, Bugel had his work cut out for him last year as the offensive line was nothing short of a MASH unit all season long. Realfootballanalysis.com has consistently maintained since its inception that adversity builds depth—and there have been many successful playoff and championship runs based on strength, depth and stability built via adversity suffered in previous seasons—given, of course, in the rare occasions that ownership maintains some level of stability in coaching staffs and management following those adverse seasons. Shanahan and Foerster will inherit some of this developed depth in backup lineman such as Edwin Williams, Chad Rinehart, and Will Montgomery among other notable new additions. 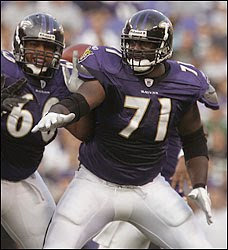 Washington scored former pro-bowl Tackle Jammal Brown in a trade with New Orleans earlier this summer—June 19 for a 3rd or 4th rounder conditional pick in 2011 (depending on which pick is sent to the Eagles as a part of the trade for Redskins quarterback, Donovan McNabb). Free agent acquisition Artis Hicks will also be among those expected make a contribution--signed from the Minnesota Vikings at the expense of some their veteran depth. Previously, most preseason reviews of teams published here have been done with defense in mind first—before analyzing offenses. Ultimately, defense may have been Shanahan’s undoing in Denver although it should be noted that he successfully delegated most of the management of his defenses to his Defensive Coordinator—and that Pat Bowlen was not an entirely hands off owner during Shanahan’s successful regime in Denver. ‘Skins fans are hoping that Dan Snyder will be hands off in letting Shanahan develop both sides of the ball under his and GM Bruce Allan’s leadership. The Redskin’s defense will be one of the bigger question marks despite the success that they are hoping to build on from what was leftover from the Greg Williams/Joe Gibbs era that was passed to the stewardship of Defensive Coordinator Greg Blache for the last couple of years. Shanahan has elected to bring in Jim Haslett as his Defensive Coordinator—and there will be plenty of adjustments and growing pains to a whole new scheme this season. All eyes are on Snyder’s 100 million dollar man—Albert Haynesworth, and how--or whether, rather—he will take to the new system, much less get enthused by the exciting new opportunities it brings him. Much less noticed, though, is the loss of Cornelius Griffin, the longstanding anchor of the defensive line for many years. Free agent acquisitions in a couple of notable retreads— Maake Kemoeatu and Adam Carriker—will help to offset this loss if they can live up to their promised potential in a short period of time. 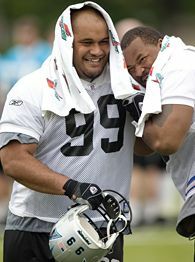 Kemoeatu anchored the defensive line for multiple Carolina Panther playoff runs alongside Kris Jenkins for some time—and the Panthers defense was reeling last summer when he went down before camp got into full swing. Carriker was once a highly touted draft choice of the St Louis Rams back in 2007 (13th Overall). Howard Green from the New York Jets was signed in the offseason and adds depth. How the defense will grow into the new 3-4 scheme may ultimately lead to success in this revolving door of additions and subtractions. Washington fans are hoping that the solid defensive play of 2009 will ultimately find its way back into the 2010 defensive performance if the players Mike Shanahan inherited can gel and adapt to the new scheme quickly—the cupboard is not bare by any means. The daunting competition in the NFC East is nothing short of stiff, and if the Redskins prove to be a .500 squad once again, then it will be a much more solid 500 record than what ‘Skins fans have had to endure under Jim Zorn. Ashburn, VA--- Albert Haynesworth finally showed up for work -- and quickly learned the Washington Redskins won't be cutting him any slack. On the eve of the first day of training camp, Haynesworth ended his months-long boycott of the team by meeting Wednesday morning with coach Mike Shanahan. Hardly sympathetic to the plight of a player who recently received a $21 million bonus, the coach wasn't about to let bygones by bygones. Shanahan said Haynesworth must pass a conditioning test in order to practice. And, assuming the test is passed, the two-time All-Pro defensive lineman with the $100 million contract won't be practicing with the starting unit, at least not right away. "I'm expecting him to be in great shape," Shanahan said. "And if he's not in great shape, then we're going to do what we need to do to get him in shape. "Once he gets to that point, hopefully he'll fit into our system and do the things we want him to do. Because, if he does, he can be an excellent football player for us. If not, we're going to be very good anyhow." Asked if he expected Haynesworth to be a part of the team in 2010, Shanahan would say only: "We'll see." "All I can do is tell you we're going to give him every opportunity to show us what we can do," the coach said. "Hopefully he'll like the position that we play him in and give us everything that he's got." 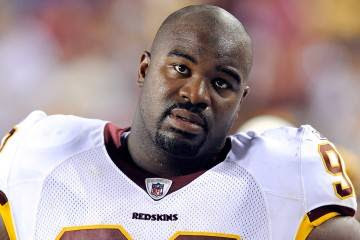 The "position that we play him in" is the main point of consternation for Haynesworth. He's unhappy with the Redskins' switch to a 3-4 defense and would rather play for another team. Shanahan was ready to grant that wish in February and March -- but the door was shut once Haynesworth collected the $21 million bonus on April 1, part of the seven-year contract he signed a year earlier. The deal is part of the enduring legacy of a decade of bad offseason signings under owner Dan Snyder. The Washington Post, citing an unnamed team source, reported Wednesday that Haynesworth is now optimistic about his situation in Washington and understands that he sometimes will have to play nose tackle in the Redskins' new defense. Haynesworth has been informed by the team that nose tackle Maake Kemoeatu is healthy, which will allow Haynesworth to play defensive end when both are playing on Washington's defensive line, the Post reported. Thus Haynesworth continues to overshadow a team trying to turn a new page. By all rights, Thursday's start of training camp should be about Shanahan and new quarterback Donovan McNabb, but instead all eyes and ears will be on the disgruntled big man whom teammates called "selfish" when he skipped the mandatory minicamp last month. Even Shanahan said at the time that it was "really a shame that Albert has got so much attention for not showing up." Shanahan said he was "very pleased" with Haynesworth's mindset during their Wednesday meeting, which perhaps could signal of change of heart. "The conversation went well," the coach said, "and now we'll get a chance to see exactly where we're at in the near future." Shanahan said he did not ask Haynesworth about the litany of legal issues that have surfaced and resurfaced during the offseason. Among the headlines: lawsuits by a bank over a loan repayment and by a man injured in an automobile accident, accusations from Haynesworth's ex-wife that he hasn't paid bills, and an allegation from an exotic dancer that he got her pregnant. "I have not addressed those issues with him," Shanahan said. "He's a grown man. Meanwhile, offensive lineman Mike Williams is out for the year after a blood clot was discovered in his lungs. Williams was a remarkable comeback story a year ago, dropping some 70 pounds as he returned to the NFL after a three-year absence to make the Redskins' roster and start eight games. This year he was expected to compete for the starting right guard spot, but a blood clot developed in his calf, leading to X-rays that located another one in his chest. With Williams out, Artis Hicks is expected to start at right guard after working much of the offseason at right tackle. Jammal Brown, acquired last month in a trade with New Orleans, is the projected starting right tackle. Todd Haley couldn't co-exist with his first offensive coordinator Chan Gailey last year, so Haley took over the play-calling duties before the season started. Hired gun Charlie Weis should get the honors this year -- most of the time. "We're going to work together," Haley said on Sports Radio 810 in Kansas City. Weis will call "most plays" but Haley will be heavily involved. As Kent Babb of the Kansas City Star points out, giving up control will be a great test for Haley to see how he's matured as a head coach since last year when he appeared to run himself ragged. Even if the Haley-Weis partnership goes just as planned, some fireworks can naturally be expected between two strong-minded coaches that aren't afraid to bark their innermost thoughts. Chad Ochocinco(notes), Terrell Owens(notes) and Antonio Bryant(notes) could become the most explosive combination in the NFL this side of Indianapolis and New Orleans. At least that’s what the Bengals hope happens – on the field. On Tuesday, the Cincinnati Bengals agreed to terms with Owens, combining him with fellow talented-yet-mercurial wide receivers Ochocinco and Bryant. Suddenly, the Wolff Planetarium in Cincy has three new celestial bodies to study. But for all those who think this combination of ego-centric beings is a recipe for disaster, there is another way to look at it: If this goes as planned, the Bengals could have their best team since 2005. That was when quarterback Carson Palmer(notes) was lighting up the NFL in his second season as a starter and the Bengals had an offensive juggernaut. The season was spoiled on the second play of the playoffs when Palmer’s knee was crumbled by Pittsburgh defensive lineman Kimo Von Oelhoffen(notes). That was also when the Bengals used three-receiver sets the way most people use socks. Back then, it was Ochocinco, T.J. Houshmandzadeh(notes) and then-rookie Chris Henry. It was special to watch as Palmer had the best season of his career. 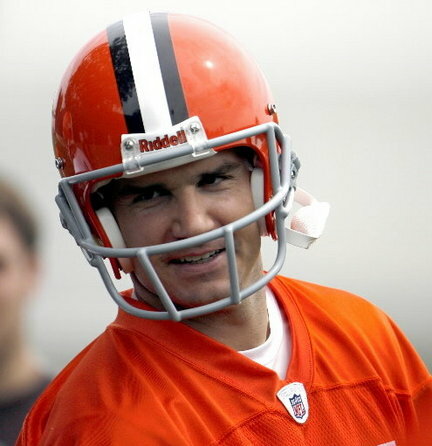 He posted career-highs in completion percentage (67.8), quarterback rating (101.1) and touchdown passes (32). The signing of Owens is an attempt to recreate that magic. The popular theory is that Owens is being brought in to replace Bryant, who many believe is struggling in his return from knee surgery. That’s not the case, says a Bengals source. The team’s medical staff went to see Bryant a little more than a week ago to check on his progress. All indications are that he’ll be fine for the season. Bryant is considered a critical cog to what the Bengals are trying to do. In the limited practice he had in the offseason, much of it was with him working in the slot. Bryant is a physical receiver who likes to work in the middle of the field. The Bengals have missed that dearly since Henry, who died tragically last year, got hurt early last season. In addition, the Bengals expect rookie tight end Jermaine Gresham(notes) to be a force in the middle. Last year, the Bengals got no meaningful production from their tight ends. The only reason the Bengals lined up so much in double tight end formations was to give them an extra blocker for the running game as they tried to play keep away and help the defense. The Bengals offense was so ineffective last season that over their final 10 games, including a first-round playoff loss to the visiting New York Jets, they scored fewer than 20 points eight times. That doesn’t work in today’s NFL, in which throwing the ball is a prerequisite. But the Bengals believe that Owens, when used in concert with Ochocinco, Bryant and Gresham, has enough left to be effective. More importantly, Owens convinced members of the coaching staff and owner Mike Brown(notes) that he understands his limitations. At 36, Owens was frank with the Bengals during a visit earlier in the offseason, admitting privately that his skills have diminished. Owens also didn’t create problems in Buffalo last season. “Seems to have turned a page,” coach Marvin Lewis said via text message. Perhaps, but Owens isn’t a model of consistent behavior. 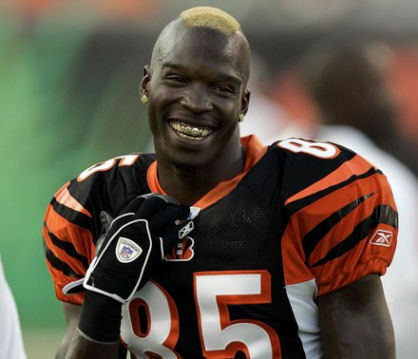 Likewise, Ochocinco has a history of diva behavior. It’s so well-chronicled that Lewis and offensive coordinator Bob Bratkowski joke openly about it and Ochocinco takes no offense. As for Bryant, he once clashed with former Dallas coach Bill Parcells to the point he threw a sweaty jersey in Parcells’ face. He clashed so much with former San Francisco coach Mike Nolan that he was released after one year of a four-year, $14 million contract. He also missed all of the 2007 season because of a suspension from the NFL for violation of the league’s substance abuse policy. Not so coincidentally, Owens and Bryant are each playing on their fifth team. That doesn’t happen with talented players who aren’t problem children. For the moment, the Bengals are simply hoping to get the talent and keep the problems at bay long enough for this to work. The Cleveland Browns, in some corners, are still the Rodney Dangerfield of the NFL. Though they've made some key veteran pickups and, by all accounts, had a good if not spectacular draft, some pundits still don't give 'em no respect. (Fidget and adjust poorly knotted tie here). Talent usually prevails in the NFL, and I just don't see a lot of it in Cleveland. I watched this team closely in minicamp, waiting to see some sort of breakthrough. Maybe Jake Delhomme, 35, would discover the fountain of youth and look like a dominant quarterback again. Perhaps a couple receivers would really step up, or a young secondary would be lockdown. I just didn't see any of it in offseason practices, which raises a lot of questions about Cleveland entering training camp. Clearly Walker didn't visit Cleveland for any offseason practices before this year or he'd know. Nobody is predicting the Browns will go to and win the Super Bowl. Well, except for one crazy Madden NFL blogger, and that guy is from England, where he not only employs the word "splendor," he spells it "splendour," and uses phrases like "return the franchise to its rightful place in the pantheon of football -- at the top." Dude, we told you not to eat the green crumpets. Anyway, most prognosticators are picking the Browns to be competitive and maybe even finish with an 8-8 record. So cheerio, pip-pip and put that in your Meerschaum, Mr. Walker. Johnathan Haggerty last fall was a star wide receiver at Southwestern Oklahoma State University; total enrollment in two campuses, slightly more than 5,100. Just to put that in perspective, The Ohio State University's enrollment was more than 63,000. Today, Haggerty is catching passes in Berea, trying to hook up as an undrafted free agent with the Browns. In June, The Plain Dealer's Mary Kay Cabot talked about the job Haggerty was doing in the OTAs. Undrafted out of small Division II Southwest Oklahoma State, Browns wide receiver Johnathan Haggerty received praise and caught the attention of coaches with a solid performance last month during OTAs. Although his strong play during practices was in shorts, the fact that he ran crisp routes, caught the ball extremely well, and a had a good rapport with Jake Delhomme is at the very least a cause for optimism. Coming into a situation in Cleveland where there is a very open competition for a roster spot at wide receiver, Haggerty is looking to do the unthinkable--catch on in the NFL as an undrafted free agent from a very small school. Hmm. An undrafted free agent receiver from a small school catching on with the Browns? How in the name of Josh Cribbs would anybody think that might happen? The Philadelphia Craigslist has a Browns Brady Quinn jersey – unworn! – for sale. Anyone want to take bets that whoever buys it -- IF anyone buys it -- isn't from Cleveland? Well, technically Mary Kay Cabot's story is not in The Plain Dealer just yet, but it will be tomorrow (and it's already posted here on cleveland.com): The Browns have signed rookie running back Montario Hardesty to a four-year deal, a league source said. According to Cabot's story, "Maximum value of the deal is $3,372,750, with a total of $1,572,750 guaranteed, the source said. The signing bonus is $1 million." Baltimore Ravens star free safety Ed Reed’s summer of discontent has earned him a pending meeting with coach John Harbaugh. Reed has recently complained about his six-year, $40 million contract that has three remaining years with base salaries of $6 million this year, $6.5 million in 2011 and $7.2 million in 2012. He has also cited a lack of support from the organization, claiming the team refused to provide him with game film to watch. And he’s still recovering from a painful hip surgery that could possibly sideline him for an undetermined portion of the regular season. Harbaugh said that he spoke with Reed on the telephone last week, adding that he plans to have a face-to-face conversation regarding the game-film issue with the former NFL Defensive Player of the Year. Reed reported for training camp at McDaniel College on Monday. “The thing he wanted to do and I agreed with was, ‘Let’s talk about that stuff one-on-one,’” Harbaugh said. “When he gets in, we’ll have a chance to sit down and work out the football part of it, that being the tape part of it. We have a policy for information that pretty much every team in the league has. Game tape, practice tape, cutups, notebooks, game-plan stuff, we handle kind of with care. “We try to control the information as much as we can, but we send it out to our players and there’s a certain communication that goes on that obviously didn’t go on very well this summer since Ed is upset about it. When I get a chance to talk to him one-on-one, we’ll get it worked out. Ed studies football. If Ed needs tape, he’ll have tape. That’s very straightforward." Reed disclosed last week during another radio interview that he was unhappy about the game-film issue. "Don't treat me like that after I gave my blood, sweat and tears for this guy, for this organization," Reed said. "I train my tail off. I'm putting my life on line, but I have to give you an excuse to study tape? When I do give you an excuse, and my excuse is I'm studying tape, that's not a good enough excuse. But Ed is wrong for asking for a new contract. "Come on, man. I don't have to be playing for them. I could retire. I don't need the money. They could come and get the money if they want. Money don't me. Money didn't put me here." Harbaugh acknowledged that Reed will begin training camp on the active physically unable to perform list, so he won’t be practicing anytime soon. It’s unclear when Reed will return, but he’s definitely expected to play this season after having his hip repaired in April. Reed has also battled a painful nerve impingement over the past few years and has said he was advised by doctors that he needs to have surgery at some point. “He will be playing for us as soon as he possibly can, and I believe it will be early as he possibly can because that’s the kind of player he is and that’s the kind of day he is,” Harbaugh said. “I agree with Ed, he has fought through injuries as well as anybody in the NFL over the last two or three years. 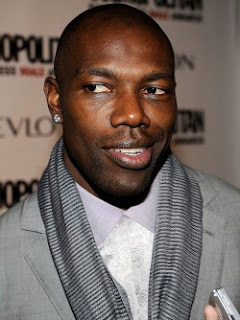 On Friday, reports surfaced that the Bengals are interested on Terrell Owens. On Saturday, the Rams publicly entered the fray. Eventually, Jay Glazer of FOX reported that the Rams would convene Monday to make a decision on whether to pursue Owens. Glazer now reports that a decision has been made. The Rams are out. The Bengals are the only other team pursuing Owens aggressively. Other teams are interested, but they are not yet going after T.O. actively -- yet. 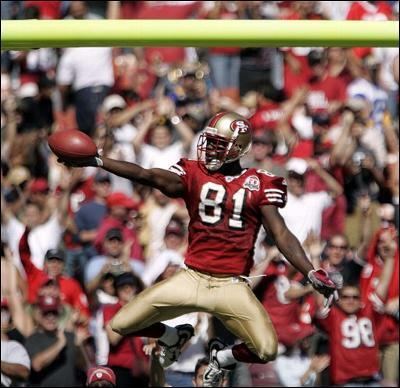 There has been a lot of talk about Terrell Owens now that training camps are opening across the country. Figured it was only a matter of time before his services were needed by some team. Rumors over the weekend had the St. Louis Rams in hot pursuit of Owens. Apparently, the Rams are going to make him an offer sometime today. Owens could accept that offer or keep shopping. And now a new team may be emerging as a potential landing spot for Owens' services. The Cincinnati Bengals, who have been involved in several TO rumors since the end of the 2009 season, could be in the market for a starting wide receiver. Chad OchoCinco is fine after his Dancing with the Stars offseason, but newly acquired wide receiver Antonio Bryant is having some knee issues. Bryant had surgery last summer and struggled with the knee during the 2009 season, and it appears still to be an issue. If Owens has not signed with the Rams yet, he could team up with OchoCinco and Carson Palmer to form what could be a pretty potent fantasy football passing game in Cincinnati. ESPN's Chris Mortensen stated on his Twitter account Friday that Antonio Bryant's surgically repaired left knee is still "a problem." Bryant, who signed a four-year, $28 million deal with the Bengals in March, had arthroscopic surgery to repair a torn left meniscus last August. Not what you want to hear if you are in the Bengals' front office or among the coaching staff. Heck, even Carson Palmer may be wary of this news. Bryant struggled last season, in part due to lingering knee issues. He upgraded quarterbacks this offseason (Josh Freeman to Carson Palmer) but may not be able to take full advantage of that upgrade if not healthy. 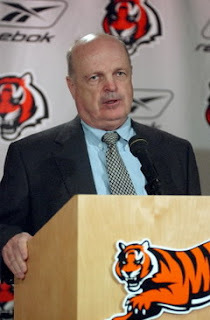 And if the Bengals bring in TO? Kiss what fantasy value Bryant has left goodbye. The Gresh and Zo [Scott Zolak] Show on 98.5 The Sports Hub in Boston reports that Welker will be a full participant in training camp immediately. With that said, they admit that he hasn't been officially cleared medically yet and the Patriots can pick and choose what drills he will participate in. Welker, once considered a long-shot to be on the field week one, now looks poised to participate in most of Patriots' training camp. His late-season knee injury could not keep him down for long, and this could throw a wrench into fantasy drafts the next few weeks. Chances are good that Welker still can be had at a good value. But if he starts camp strong and looks like he will be ready for the season opener, expect a steep increase in fantasy value. Schilens underwent a second surgery on a broken fifth metatarsal on his left foot following the season. The Raiders head coach, Tom Cable, initially predicted that Chaz wouldn't be ready for training camp but Schilens is apparently ahead of schedule. Perhaps Schilens can reach his fantasy potential this season with a more consistent quarterback, if he can stay healthy. During their conversations, Stewart told him he was finally healthy again and fully recovered. Not much to this, really. Fantasy owners have been dealing with ailments from Stewart since he entered the league. But he has proven to be one tough cookie and that is exactly what fantasy owners are looking for in a stud running back. 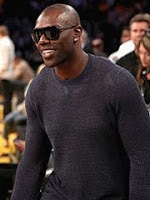 As momentum builds toward receiver Terrell Owens signing with his fifth NFL team, two teams are the most interested in the veteran wideout: the Bengals and the Rams. We're told that other teams are interested, but not at the same level of urgency. For now, the other interested teams aren't known. That could prompt some to conclude that there are no other interested teams. Then again, many were saying before the Bengals and Rams emerged that there were no interested teams at all. In the end, the question for Owens will be whether he wants to get a deal done now with St. Louis or Cincinnati, or whether he wants to wait for the possibility that a starting receiver with another team ends up tearing an ACL in the early days of camp. Adalius Thomas has languished on the free agent market since late April, so it should be apparent by now that the rest of the league shares the Patriots evaluation of the linebacker. Just in case you needed confirmation, there's this note from Rich Cimini of ESPNNewYork. "[Rex] Ryan himself indicated there could be some interest down the road. Well, don't hold your breath on that happening. Right now, the Jets have no interest in Thomas." Thomas could be looking for too much money when teams see him as a part-time player. Still, it's telling that his old employers in Baltimore and his old boss in New York have said no thanks. MIAMI (AP)—The agent for Montavious Stanley(notes) says the defensive tackle has agreed to terms with the Miami Dolphins. Stanley played in 15 games as a reserve for Jacksonville last season. 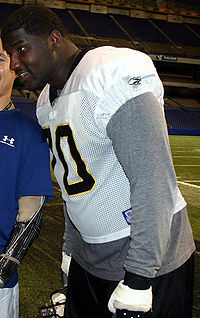 Drafted in the sixth round by Dallas in 2006, he has also played for New Orleans and Atlanta. He’s expected to compete for a job as a reserve with the Dolphins, who begin training camp Friday. The deal was confirmed Sunday by Stanley’s agent, Ralph Cindrich, but has not been announced by the Dolphins. The New York Giants have agreed to terms with free agent linebacker Keith Bulluck(notes). Agent Gary Wichard says Bulluck and the team came to an agreement Saturday. Media reports said the deal was for one year and $2.5 million. 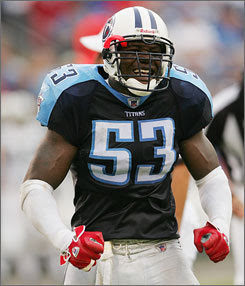 Bulluck has spent his entire 10-year career with the Tennessee Titans. He was a first-round pick out of Syracuse in 2000 and grew up in New City, N.Y., about 30 miles north of where the Giants play in East Rutherford, N.J. The Giants have been looking for a replacement for middle linebacker Antonio Pierce(notes), who was released after last season. Former Buffalo Bills linebacker John DiGiorgio has decided to retire from the NFL due to knee injuries. He announced his retirement on his Facebook account. "I just wanna say thank you to everyone that has ever supported me throughout my career," DiGiorgio wrote. "I've done everything I could in therapy to try to get my knee healthy and get back and play the game I love most. Unfortunately I fell a bit short. I recently decided to retire from the NFL and gladly accept a teaching and a coaching job at Chippewa Valley High School. Thanks for all the support, Go Bills!" 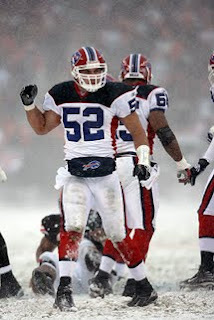 DiGiorgio started 14 games in 2007 for the Bills, recording 113 tackles and two sacks. DiGiorgio was signed by the Bills as an undrafted free agent in 2006 out of Saginaw Valley State. 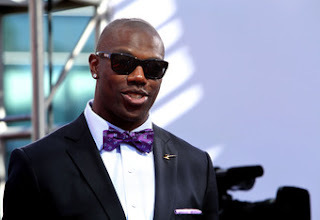 ESPN’s Chris Mortensen has reported that the Rams are in “serious” pursuit of free-agent wide receiver Terrell Owens. The Rams are extremely thin on the depth chart at wide receiver. They have Donnie Avery, Laurent Robinson, Brandon Gibson and rookie Mardy Gilyard as top possibilities on their roster. So, yes, the Rams could use some help. If coach Steve Spagnuolo can buy into what Owens has been selling – that he isn’t a distraction and a problem in the locker room – maybe he will be willing to pair Owens with rookie quarterback Sam Bradford. Certainly the Rams want t outfit their franchise quarterback with all the tools needed. Stay tuned. Cincinnati might not be the only possibility. Wes Welker's surprisingly fast recovery from ACL surgery is expected to take a big step on the first day of training camp. If the report proves true, that means Welker won't be placed on the active/PUP list to start camp, which is a mild surprise. This would eliminate the possibility that Welker could miss the first six games of the season, and increase the likelihood that Welker could be ready for Week One. We're a little cautious about passing along the report, because the army of quality Patriots beat writers haven't uncovered this one yet. Can we get a confirmation, people? We reported earlier today that Dolphins defensive end Phillip Merling has an Achilles' tendon injury. Armando Salguero of the Miami Herald reports that Merling will miss the entire season due to the injury. Jackson also reports that the injury was suffered during football-related activities, which means that Merling will receive the full amount of his $600,000 base salary, if/when he lands on injured reserve. Of course, that amount could be reduced if/when Merling is suspended by the league for violating the Personal Conduct Policy. He faces felony charges after allegedly beating up his pregnant girlfriend. Salguero also reports that the Dolphins may eventually make a play for Cowboys defensive end Marcus Spears. Selected by Dolphins V.P. of football operations Bill Parcells in the first round of the 2005 draft while Parcells was working as head coach of the Cowboys, Spears could be on the outs in Dallas. Which could put him on the ins in Miami. The Dallas Cowboys agreed to terms with Dez Bryant on Thursday, making the receiver the first of this year's NFL first-round picks with a deal. Bryant's five-year deal could be worth roughly $12 million total and includes more than $8.5 million in guaranteed money, NFL Network insider Jason La Canfora reported, citing a league source. The Cowboys announced the deal a day before they report to training camp in San Antonio, Texas. The first workout is scheduled for Saturday. "This was very important to me to be able to get this done in time for the first practice," Bryant said. "I want to help this team. I want to compete. I can't wait to start playing football again." 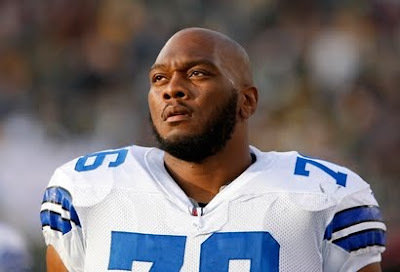 Dallas traded up three spots in April to get Bryant with the 24th pick in the 2010 NFL Draft. Cowboys owner Jerry Jones gave Bryant No. 88, the jersey worn by Hall of Famer Michael Irvin and, a generation earlier, by Drew Pearson. Bryant was an All-American in 2008 at Oklahoma State when he had 87 receptions for 1,480 yards and 19 touchdowns. But he played only three games last season because of his suspension for lying to the NCAA about his activities with former NFL star Deion Sanders. In 27 games at Oklahoma State, Bryant had 147 catches for 2,425 yards (16.5 yards per catch) and 29 touchdowns. He also returned 22 punts for a 19.6-yard average and three touchdowns. The Cleveland Browns have signed quarterback Colt McCoy, one of the team's two third-round draft picks, NFL Network insider Jason La Canfora reported, citing a league source. The four-year deal is worth a maximum of $5 million. McCoy, 6-foot-1 and 216 pounds, passed for 13,253 yards and 112 touchdowns at Texas, both school records. He was a finalist for the Heisman Trophy as a junior and a senior. 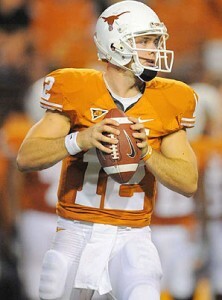 McCoy went 45-8 as a four-year starter with the Longhorns, leaving as college football's career leader in victories. In April, McCoy called joining the Browns "the perfect fit," even if he had to wait until the third round to be selected. Browns president Mike Holmgren already has said he wants McCoy to stay on the sideline next season, learning behind veterans Jake Delhomme and Seneca Wallace. McCray appeared to be in line to compete for a starting job in 2010 when the Saints released former starter Charles Grant, who had missed the postseason with a torn triceps. The Saints have re-signed defensive end Bobby McCray to a one-year contract just one month after abruptly releasing him. However, New Orleans signed former Chicago Bears starting defensive end Alex Brown, along with former Tampa Bay lineman Jimmy Wilkerson, who has the versatility to play on the interior or on the outside of the defensive line. During minicamp in early June, McCray saw a lot of action with the first team while Brown was still new to the Saints' scheme and Wilkerson was limited in practice while continuing to rehabilitate a left knee injury. When the Saints released McCray on June 21, it appeared they were planning to move forward with Brown and Wilkerson rotating at left defensive end and Will Smith playing most of the snaps on the right side. McCray was left "speechless" by the move, according to The Times-Picayune. 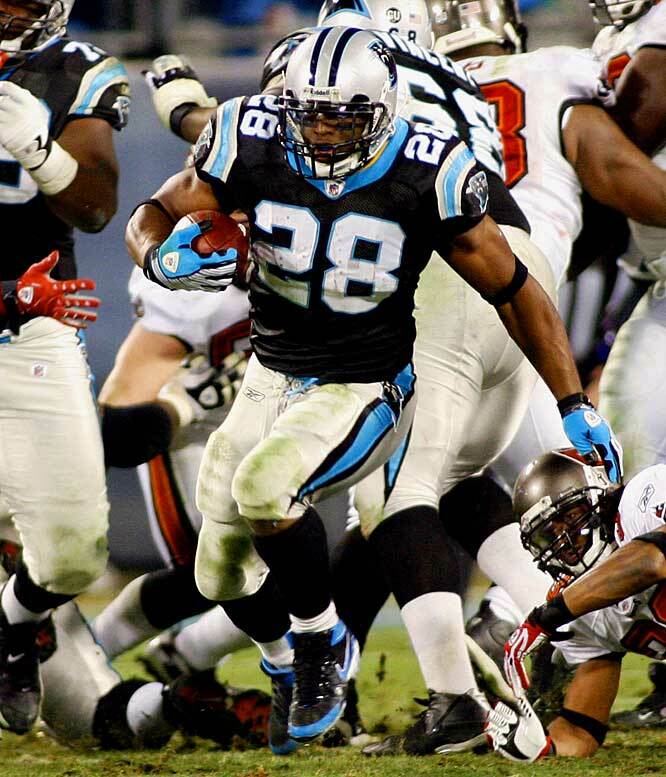 McCray started all three of the defending champions' playoff games last season, making six tackles and a memorable block that flattened Arizona quarterback Kurt Warner after an interception. McCray has played all 32 regular season games since joining the team as an unrestricted free agent in 2008, registering 7.5 sacks. The six-year veteran has tallied 29.5 career sacks with eight forced fumbles and a fumble recovery. The Saints also announced Thursday that they have signed center Matt Tennant, the team's 2010 fifth-round draft pick. Training camp for the Saints opens on July 29. There’s certainly a sense of drama surrounding everything Brett Favre does, even if we think we know that he’s almost certain to return for a 20th NFL season in 2010. Favre said he isn’t in a position to guarantee that return, and that he hasn’t been given a deadline by Vikings coach Brad Childress, either. So, really, as Favre works out with the high school players in Mississippi, not much has changed. But we expect that will change when Favre says he’s returning. But it was brought to light in a recent article in Men’s Journal that his agent, Bus Cook, referred to Favre as a “drama queen” over his indecision to return this season. Presumably, only Favre, Cook and Stephen Rodrick, the author of the piece, were in the room that day, and Favre is taking exception to the way the comments were portrayed. Redskins coach Mike Shanahan says he has met disgruntled DT Albert Haynesworth(notes) before the player accepted a $21 million roster bonus in April and at the time the player said he’d play any position the coaches wanted. Haynesworth since has changed his mind and skipped all spring practices and workouts. "I made it crystal clear to him that if he did take that $21 million dollars, we expected him to play at the position we feel gives us the best chance to win," Shanahan told WFAN-AM on Monday. "I’d expect him to play any position that we thought was in the best interest of the Washington Redskins be it nose tackle, defensive end, if we wanted to play him at free safety. … So (we) expected him to come in (to training camp) in great shape and do the things we expected of him and that he’s capable of doing. Hopefully, he does that. "I’m looking forward to camp starting. And my understanding is that Albert’s going to be there. … He didn’t show up at mini-camp, so guys are going to be looking at him and seeing what type of shape he’s in, if he’s doing to do the little things the right way. Time will tell. If he is buying in and he is in great shape, we know what type of talent he is and we know he can help our football team win." Strapped with just two picks in the first three round of the NFL draft, and a free agent class that was very light on players worth a significant amount of money, the Redskins focused their 2010 resources on two main areas: the quarterback position and the offensive line. Few would argue that something needed to be done about both areas of the offense, and the Redskins get participation points, certainly, for creativity in finding a way to acquire Trent Williams, Donovan McNabb, and Jamaal Brown in the same offseason. These moves, while made with a varying degree of prudence, were all made with an ideal amount of aggression, and offer a very different prospectus for the 2010 season than you would have expected based on the results of the 2009 season. Of course, when all of the resources you have for your offense are allocated to just two positions, that essentially means that you are skimping on others. The Redskins have toyed with the idea of giving up more to receive Vincent Jackson -- Hog Heaven has learned that a deal has been close for at least a week -- but that the Redskins are (rightfully) reluctant to trade for Jackson unless they can move Albert Haynesworth in the deal. Keep in mind that the Redskins aren't actively trying to get rid of Haynesworth (if they were, he'd be gone), rather, they are trying to drive up his price in the market. This takes time, and if I had to guess, I would say that Haynesworth is probably a Redskin on opening day, and Jackson is probably a Charger, although something could happen with that before his suspension concludes in Week 4. So with resources allocated to changing the quarterback, upgrading the offensive line, and possibly adding a deep threat to the wide receiver position, the one place that the Redskins have notably gone the "very, very available" player route is the running back position. Using resources elsewhere is no excuse for poor performance, and the Redskins will have to strike a balance that allows them to get productivity from three (four?) guys who were very unproductive in 2009. This article will also touch on the obvious possibility that Brian Westbrook is a Redskin by the end of the month, as to consider him part of the mix until he officially takes his services elsewhere. Portis will turn 29 on September 1st, and this will be his ninth NFL season. It will almost certainly be his final year in Washington, save for a ridiculous statline such as 1,250 yards on 260 carries and 7 TDs, and a subsequent "early thirties" peak had by guys such as Corey Dillon, Fred Taylor, Thomas Jones, and Curtis Martin. Portis isn't a disimilar runner to any of those guys, but realistically, his 29 years is much closer to a 31 for a back who hasn't been doing it since age 20 (Portis' age in the 2002 preseason). 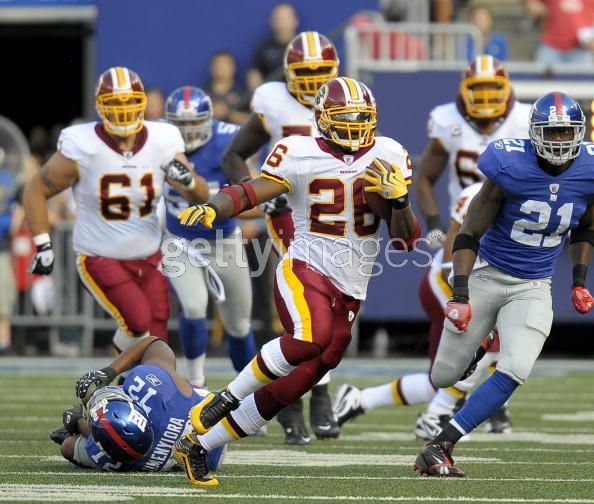 It would be wrong to suggest Clinton Portis is "done." Portis probably has multiple years left as a strong NFL runner, and potentially a very valuable one, but it's important to note that Portis was last an "explosive" runner in 2006 at age 25. Those days, as you may have guessed, aren't coming back. When Portis had his 1487 yard season in 2008, he did so on a 4.3 yard per carry average and only one run over 30 yards the entire year. Portis is simply not a threat to take it to the house every time he touches the ball, he's only a threat to score once he's inside the seven yard line. Portis is best used as the lead back in this offense, but he's at his best when the team doesn't use him so much in the early season. Perhaps one of Jim Zorn's biggest issues last season is that when the Redskins came out with a decent offensive plan -- Jason Campbell was averaging more than 8.0 yards per attempt through the first two games in a passing friendly adaptation of the spread offense, but with the team unable to consistently generate points (26 points in two games), the Redskins spent the next four weeks going to strictly pro-style power formations, taking the game out of Campbell's hands and handing it to the highly ineffective Portis. Portis continues to chew through his many lives in Washington, though he's likely down to his very last one. Barring a comeback player of year type season, Portis is likely to leave the Redskins quietly (for a change) in the offseason, and finish the final two or three years of his career in the New England backfield. Portis can still carry the ball 27 times a game at two or three different points in the season, but for most of the year, he's a 10-12 carry player in this offense. You are looking at roughly 200 carries from Portis, four touchdowns, about four yards per carry for 800-850 yards, another 150 in the air as a receiver, and most of that production during the fantasy playoffs. For sure, he's going to be a frustrating player to have on your fantasy roster all year, but historically, December is Portis' best month, and the overall decline of his total yards isn't going to change his dominance in that month. You're doing well for yourself if he's the third running back on your roster. It's a lot less controversial to suggest that Larry Johnson is done as a valuable back, and while Portis might enjoy a late career rebound as a useful player, Johnson's gains are likely to be purely academic. The zone blocking scheme is going to do wonders for a yard per carry average that fell to a paltry 3.3 last year, as Johnson should do enough in the open field to bring that number back towards 4.0 (and will probably exceed it). The problem with Johnson is that he's almost certain to lead the team in "stuffs" at the line of scrimmage, even though Portis figures to carry the ball 50-60 more times than LJ will over the course of the season. Johnson runs with better vision than Portis, but he also runs straight up and has so his whole career. Johnson will probably have a run or three over 25 yards this year, including a touchdown scored from outside the five yard line, and that will make his yard per carry average look a lot more valuable than it really is. The Redskins have long had a problem with RB usage patterns, namely, that they had such a stud runner in Portis who could take the ball inside or outside that neither Gibbs nor Saunders nor Zorn could draw up plays for the backup running backs because if it was a critical play, Portis had to be in there. Theoretically, that's still a problem for this team: there will not be a snap where it makes more sense for Johnson to take it over Portis. However, the difference is that the Shanahans do a much better job of really rotating their running backs in there to get Johnson his touches, even when there's no reason to get Johnson any touches. That's good from a "saving Portis' legs" perspective, and it's good from the perspective of Johnson's fantasy owners -- 8 to 9 carries a game even when Portis is perfectly healthy, a few more when he isn't. The biggest false myth for your fantasy draft is that Larry Johnson is going to be the Redskins' goal line back. He will not be. The goal line back in the Shanahan offense is more dependent on what play he's running, which might call for the hard-running/slashing style of Willie Parker, or it might call for the slashing/receiving skill set of a Brian Westbrook or Ryan Torain. But when the goal is pure power and leg drive from inside the three yardline, Clinton Portis is still the workhorse of the group. Johnson is the least likely Redskins back to carry on the goal line because, as mentioned above, Portis is better at it in every way. That, and Johnson went touchdown-less in a 16 game season in 2009. He'll score between once and three times this season, but it won't be when expected, one might come through the air, and he's good for only about 600 rushing yards spread pretty evenly over the season, but likely declining near the playoffs. That's a very fringe use of a fantasy football roster spot. Johnson's career will come to a close after his year or two with the Redskins. It's hard to defend the Willie Parker signing. From an X's and O's perspective, his running style offers a small change of pace over Portis, and in an offense that prides itself on deception, Parker has some value. But if you had any dreams of a quick third down back here, Parker has been a dreadful receiver over the last two Steelers seasons. Combined, he has nine catches on eighteen targets (that's TWO seasons), which is probably what his receiving season here would look like if he made the team. In addition, Parker's breakaway speed is history. He still has great functional short area speed to use in the flats, but again, he's a terrible receiver out of the backfield. If Parker makes the team, he's probably going to spend most of the season as an inactive scratch from the team in favor of a different third running back, be it Keiland Williams, Brian Westbrook, Ryan Torain, or Mike Sellers. If you really understand what it is like to go through a Shanahan training camp, you'd understand just how far Willie Parker's back is against the wall here. If the team signs Brian Westbrook, he might just get Parker's roster spot straight up. When you look at a highly touted college player such as Keiland Williams, and the fact that Mike Shanahan has never been shy about starting rookie runners who he thought had earned their playing time, Parker becomes just a placeholder on that roster spot. But then you consider that even if Parker plays well in camp, he doesn't even have the contractual security to force Larry Johnson off the roster, as Johnson got guaranteed millions in his three year contract, and Parker just got a salary that becomes fully guaranteed if he makes the roster for Week 1 (which makes him even less likely to make it). If Parker makes it, you can pencil him in for 70 carries, split by a week or two as the feature back, and about eight other weeks where he's active and gets about four or five carries in the game. He's going to average about 3.6 yards per carry for a 250 yard season. I'm not projecting him to find the endzone this year. If Westbrook is signed by the Redskins before training camp, he becomes the second most valuable back on the roster from a fantasy perspective, and probably the number one guy from a football perspective. Carry-wise, Parker's estimate of 70 is probably accurate for him, and you can bump that up by 20 or 25 if you're going to project him for 14 or more active games, which might be foolish given his injury history. Westbrook would be a good bet to lead the team in yards per carry, as he's yet to drop under 4.0 for his career. He's a 4.5 YPC back in this offense, which would project him for between 350 and 500 rushing yards depending on which end of the "Brian Westbrook health spectrum" your faith falls in. He could score one or two times on the ground from distance, but he could also emerge as a valuable receiver in the red zone where Donovan McNabb absolutely loves him. In a full season, that might be another 8 total TDs, but in a half season as a third running back, that's closer to 3 or 4. Still, 6 total TDs from a guy who is 100% available in late July is pretty much a steal, and touchdown scoring is going to be Westbrook's primary use in the twilight of his career. Some talent evaluators believe that Williams might be the best pro prospect to come from the LSU backfield in quite some time. Teammate Trindon Holliday was drafted in the 6th round for his world-class speed, and this backfield featured Charles Scott, but when you look at the Redskins draft, you can't help but notice that two of the players that they selected are Louisiana based athletes who simply weren't rated highly on any boards: LB Perry Riley (LSU), and TE Dennis Morris (Louisiana Tech). Williams' spot on the roster would be strange otherwise, but clearly, the Redskins signed him thinking that they came away with the best player in the offensive backfield of the Tigers. Whether Williams is good enough to make the team remains to be seen, but unless Brian Westbrook signs soon, Williams is probably the odds on favorite to be the Redskins' third running back this year. And in Shanahan-land, that means an injury away from being a no. 1 RB in the NFL. Clearly, the guy is smart enough to notice a good situation when he sees it, and I'd probably take 2 to 1 odds this night that Keiland Williams is the next 1,000 yard runner for the Redskins.